Apple iWatch to arrive in October with curved OLED screen, blood glucose sensor and more? There has been a slight pause in Apple iPhone 6 leaks as speculation about the Apple iWatch has taken center stage. Thursday, Cantor Fitzgerald's Brian White predicted that the timepiece would be unveiled, along with the Apple iPhone 6, in September. White also called for a $200 to $230 price for the wearable. Today, we have some more rumors pertaining to the Apple iWatch courtesy of those anonymous industry sources. 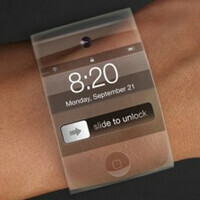 The timepiece will be launched in October, according to the latest speculation, and will feature a curved OLED screen. As expected, the iWatch will contain sensors for obtaining health-related readings such as calorie consumption, blood oxygen levels, sleep activity and blood glucose levels. The latter is a measurement used by diabetics to determine how much insulin they need to take. Given the price of the test strips that diabetics use for this test, if Apple does this right, it could have a home run on its hands. According to an iWatch supplier, Apple plans on knocking out three to five million units each month. That is more than the total number of smartwatch-like devices sold for all of last year. Apple has partnered with the Cleveland Clinic and the Mayo Clinic on the health side of the equation. It has also teamed up with Nike for the sports-related functions expected on the watch. Well....they don't know what to do with it. No it doesn't it can just be used as reference, working continuously, and a real test strip can be used when you need to actually use your insulin. The FDA doesn't have to approve crap. Why anyone trust what the FDA approves anyway is utter non-sense to me anyway, they're full of crap, but that's a different topic. How about a holographic reality distortion field to further fool ifans? I heard it was going to print money as well. It uses a built in GPS to identify where you are, then print the currency of that country. Seriously, can't we just wait for some solid information or for it to be released instead of the dozens of stories guessing what Apple is going to release? Yeah, these claims are ridiculous. In order to get the blood glucose level you need a blood sample, and no watch is going to be plugged into your circulatory system. And an oxymeter is going to require an area of your body it can shine a bright light through for the spectrometry, like a finger or earlobe. And it's not a thick glove, it's a designer watch. And calorie consumption? Come on, there's no way to measure your consumption with a watch, or any bigger device for that matter. The sleep activity could be correct since there's already devices on the market that measure this somewhat accurately using accelerometers. If you want it more accurate, you'll need electrodes attached to your head. I have the smartband and the only reason I use it is the sleep time calculation lol. Oh yees, I'm sure Apple will have pioneered a revolutionary medical device that could earn them a fortune only to stick it into a smartwatch. Keep sipping that Cool-Aid. It needs a high level of accuracy for approval. And if Apple releases a product that causes people harm they're in a world of trouble from the liability they risk. You didn't read my post you just wrote the nonsense in your head like you quoted a bible scripture. The technology already exists, Apple doesn't have to pioneer anything - and like weight loss pills, vitamins, and vitamin shake supplements etc, do not "harm" anyone but also have a warning label: "These statemetns have not been evluated by the FDA, this product is not mean to treat, or cure any disease." Slapping a similar warning on the box will remove any liability from Apple, again because a smart watch is not a medical device it doesn't need FDA approval to be accepted into the market to be used by people. Cleveland and Mayo Clinics... Apple is going to set the bar again... As the iPhone, iPad, Macbook Air. And this is coming from an Android/Google fan. So if someone agrees with you, they're OK, and if not their hermetic geeks? OK........ You sometimes bring up decent points, but then a post like this makes me rethink that. There is a difference between knowledgeable and all knowing. "Instert absolute hate for Apple here _________________" < Has no friends. You might want to check out some anger management classes, that much anger isn't healthy. Even the choice of your user name shows you have some issues that need to be worked out, please get some help soon. Does everything but tell time. Just kidding. As long as it is a decent looking and functioning device I will give it try. So far the only good looking wearable device i have seen is the Moto 360. When I step back from all these smartwatch and smartphone announcements, I really wonder where the benefit is for the customer. All of these gadgets are somewhat expensive for many people and add little to one's quality of life. How will knowing one's heartbeat or blood oxygen level really make a difference in a healthy person's day to day experience of life? I can see some benefit for a glucose meter that doesn't require a blood sample, but that will likely be a medical device, not a run of the mill smartwatch. As for sleep quality, as Beijendorf pointed out, without electrodes mounted on one's head, there is no way to understand what quality of sleep a person is getting. Making conclusions based on tossing and turning is a sketchy practice. Much as it has been shown that many people you don't use Facebook are happier than those who use Facebook, I am guessing that the people who don't use smartphones, smartwatches, 24/7 health monitors, etc. are going to be happier and less stressed than those who do. Yet you got Droid zombies, with NO brains. What's the difference I ask?